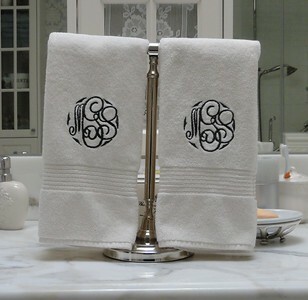 Design and monogram are from Brother Persona machine. 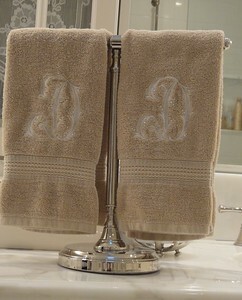 Embroidery Arts' "Royal" on Restoration Hardware's thick and lush towels. 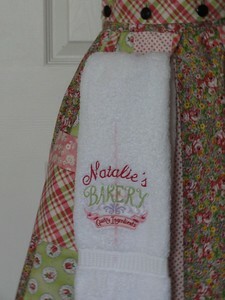 I didn't embroider the tub mat because I was afraid, because it was so thick! 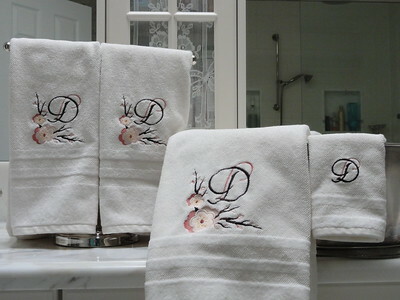 Embroidery Arts "Royal". 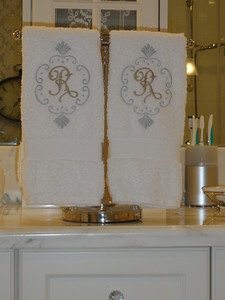 My towel stand is askew and so is my embroidery...one towel is stitched higher than the other. 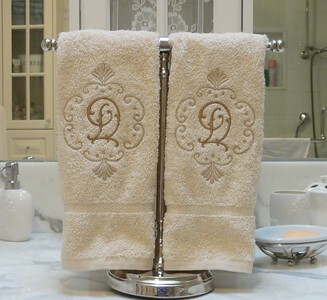 Fortunately, she only has one out at a time on a towel ring. 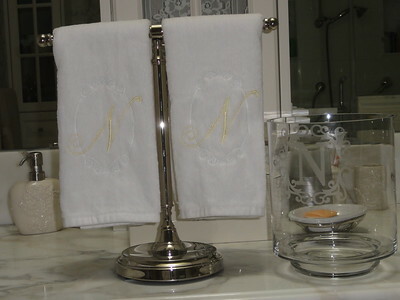 Test set, before doing the really nice ones from Restoration Hardware. These ones are from RH too, but from the outlet store. They are nice quality, but do not compare to the catalogue ones! 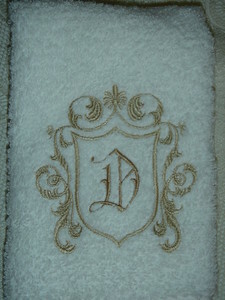 Design: Embroidery Arts' "Royal" which they describe as looking something like a soccer ball, Marco's favourite sport! 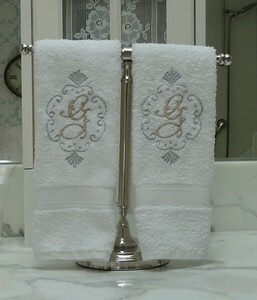 My Aunt and I stitched these together on my machine, for her bathroom. 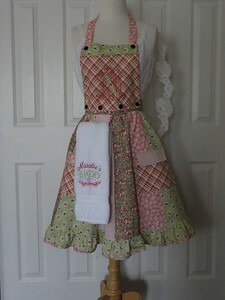 She was immediately smitten and within days bought an embroidery machine! 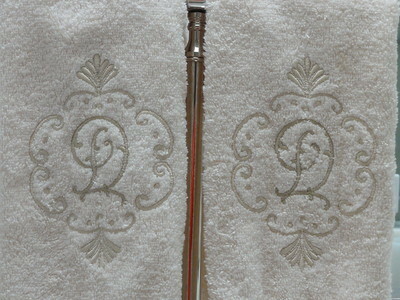 Font is Embroidery Arts Arabesque 9. On my own I would have stitched the letter in a darker tone, but this was the suggestion from my friend's sister. 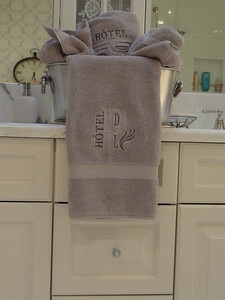 I will replace this picture once the towel is washed! We still have chalk marks and WSS here. 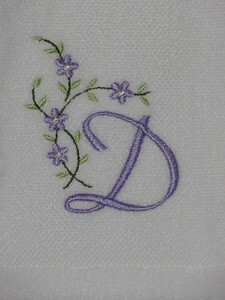 Design is Embroidery Library, name added with Bernina Artista software. Font: Monogram Wizard (will add name once I look it up! 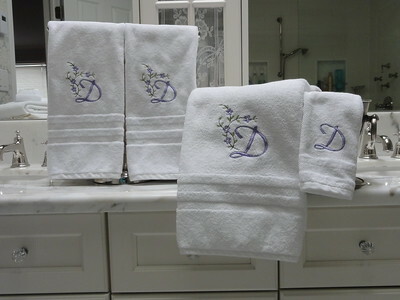 These are a going away gift for Mom and Dad. 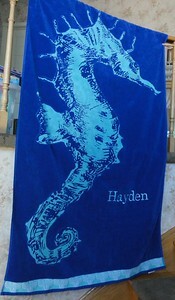 Kids got the beach towels. 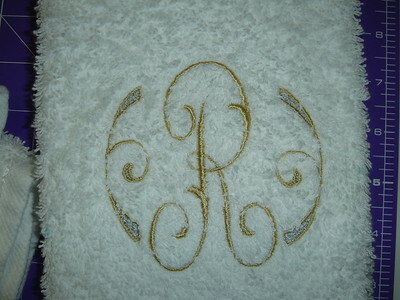 Font is Embroidery Arts Arabesque 5. Frame is Martha Pullen IEC. Will add the date once I look it up. My photography doesn't show the colour properly. 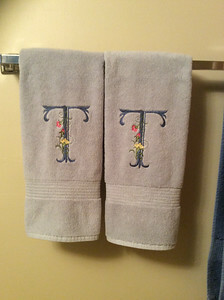 It is a lovely turquoise that matches the towel. 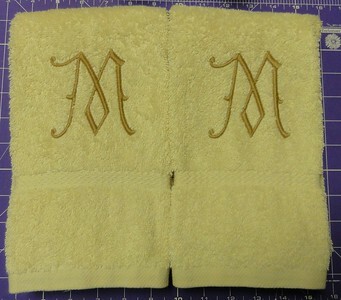 Name is either Monogram Wizard Library or Bernina Artista Blackboard... can't remember which I went with! 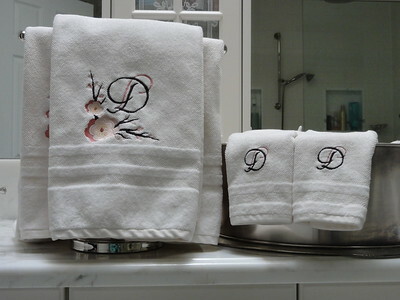 Design and letter from Bernina Artista software. 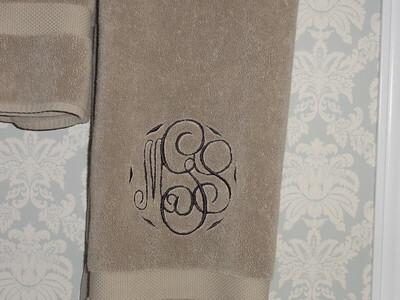 Monogram Wizard's "Vine". I thought the swirly doodle was MW as well, but now I can't find it. It was duplicated and mirrored to create, and the little diamond in the middle was added in my software. Found it, it is MW, swirls 11! Martha Pullen's 2013 IEC, Zany alphabet. Martha Pullen's 2013 IEC, Zany alphabet. 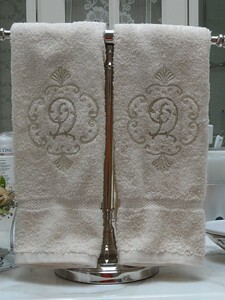 My cousin's daughters chose this for their mother for their powder room. 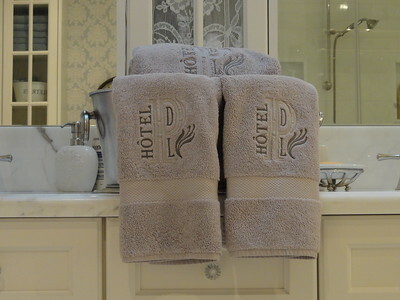 The colour will really look good in the room since the walls are grey, and the fixtures and cabinet white and there is no other colour in the room! H is Embroidery Arts Arabesque 5. Another better-late-than-never gift! 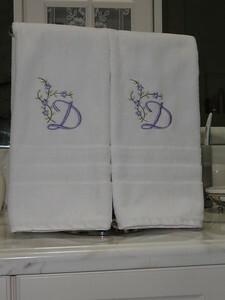 Font is Embroidery Arts Gothic 7. Thread is Isacord 1123. 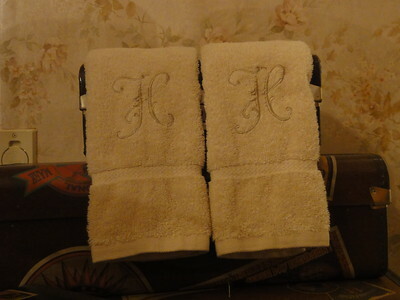 These are part of a wedding gift. 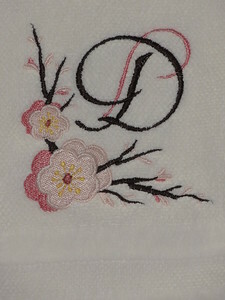 The cherry blossum design is from Embroidery Library. 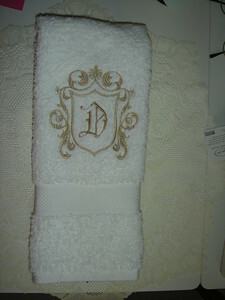 The D is Embroidery Arts "Art Nouveau 3" but I discovered after I bought it that it is the same as MW's "Duo Tone." 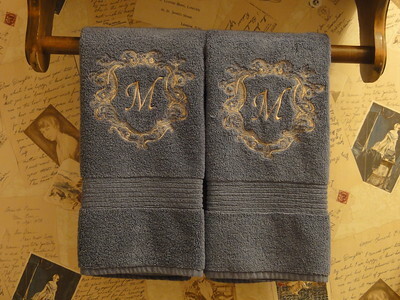 These are for a 25th Anniversary gift. 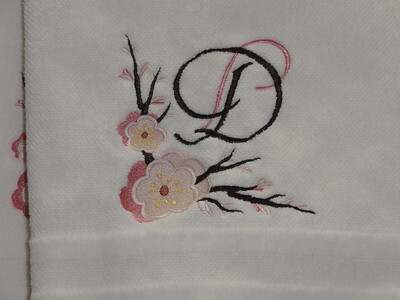 The D is "Empress" from my Artista software and the design is from Martha Pullen's Dainty Designs. 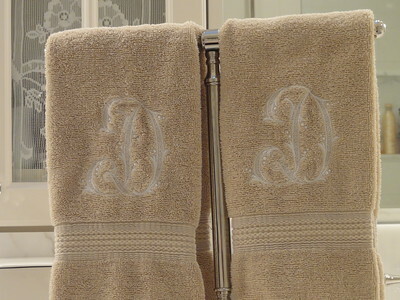 More than a little late... Design is Jennilee's Digistitches "Isabella" monogram. I embroidered these for one of the guys at work... he had his house broken into and they lost a lot, including some family heirlooms. Design is Martha Pullen, IEC, 2008. 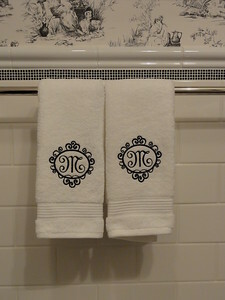 Letter is Monogram Wizard Charleston, from alpha pak 009. 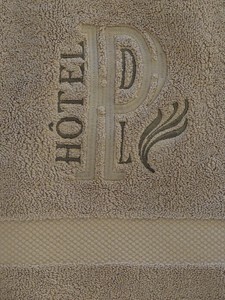 HOTEL, D & L are from my Artista software, P is Embroidery Arts Diplomat, increased in size. 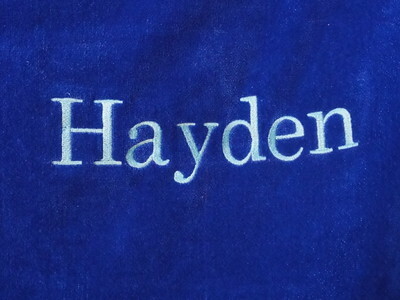 Swirly bit is Monogram Wizard "Coastal 12" from Alpha Pak 9. 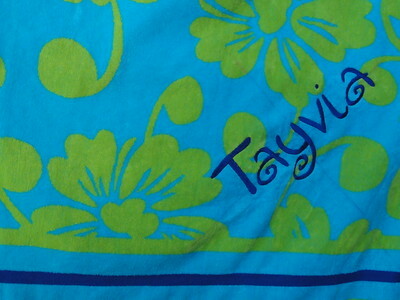 My photography is poor... it is embroidered straight! That is a D in the middle of the P for David and an L down below for Lisa. The Better Late Than Never Gift Co. Inc. strikes again. 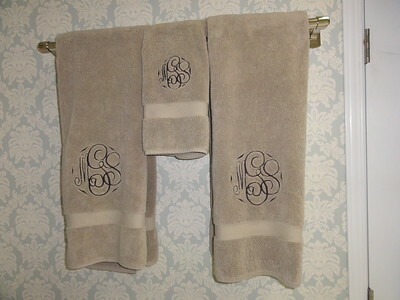 House is long lived in and finally I have the towels ready! Oh well. These are silver (Mettler 3770) and gold (Mettler 1172). 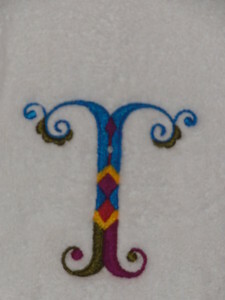 The silver letter is Embroidery Arts Arabesque 5, and design is Martha Pullen, IEC, 2008. 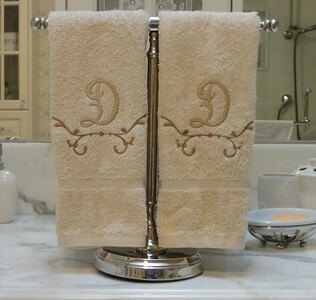 I was aiming for towels that would fit in anywhere... and look elegant and understated. I am not sure that I realized any of those goals. Oh well. Again with the oh wells... they are done! A going away gift for my wonderful neighbours of 25 years. Miss them terribly! 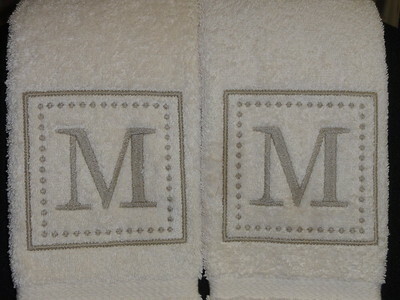 Fuzzy on the details... design (frame) is probably MP IEC, monogram is Embroidery Arts Gothic 7. Sharing a couple of my not so successful projects with you... hope my booboos help someone else! 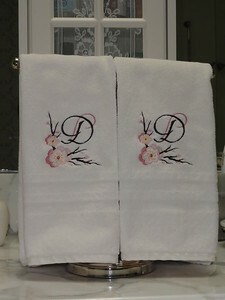 This is Embroidery Arts Arabesque 8. It looks too skinny to me. Then I learned that if I had increased the pull compensation to 3.5 or 4.00 (default is 2) then the stitching would have looked "fatter." 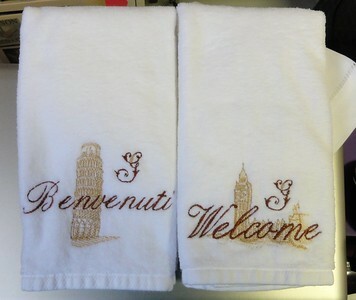 I guess all of these years I have just been using fatter fonts on my towels. 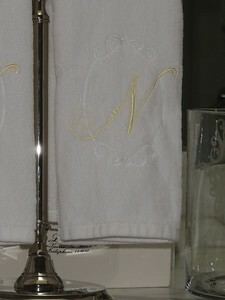 So I will try this monogram on towels another time. 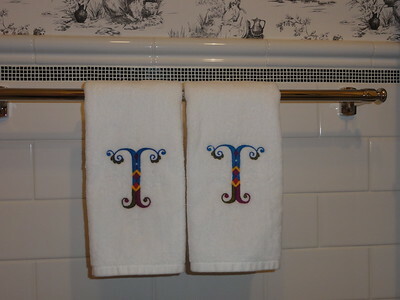 Meantime I am giving these away as "seconds" and will get another set of towels to do for my "R" friend! Oh, and don't ask me how but one ended up off center too.